In the last year of the Holy Prophets (p.b.u.h.a.h.p) life, according to the Divine Intuition of the Quran's verses, a mission was revealed to him so he announced the pilgrimage much towards Hajj. Muslims arrived from all corners near and far and a huge multitude accumulated and they traveled along with the holly Prophets (p.b.u.h.a.h.p) caravan to Mecco. On the return trip of this magnificent journey to Hajj, in an area called Ghadeer-e-khum, where the road branched off into different directions and the citizens of Iraq, Hejaz and Sham took their different routs, a great and new mission was given to the Holly Prophet (p.b.u.h.a.h.p.). On that location another Divine order was revealed to him to congregate the Muslims and tell them something of great importance, he must tell them immediately. It was noon and the Hejaz sun beat down relentlessly, but in the meanwhile, there was a more important and serious matter to attend to and that was the intending demise of the Holy Prophet (p.b.u.h.a.h.p.) the matter of his will and his successor. 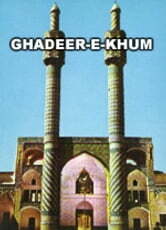 The story, that he reached us today, of Ghadeer was told by many of the Prophets (p.b.u.h.) close companions and followers, maybe no other historical story has reached us from so many diverse traditions. Now, this interesting story of Hajj and after that event, the important testament which distinguishes the Islamic path a Muslim must take, also, the verses revealed on that story and the reaction of groups and individuals and other related information is studied in this short, concise book .